Korinthian Violins offers a wide range of instruments for sale with new things coming in on consignment regularly. If you need a fractional size instrument, or even a full size but are just beginning, we generally recommend that people rent to start. However if you have plans for the instrument once it is outgrown or are simply more comfortable owning rather than renting, our rental level outfits are $550 for violin, $650 for viola, and $1800 for cello. (We no longer rent cellos, but rental level cello outfits are still available for sale.) Violins and violas include dart shaped suspension cases and a bow, and cellos include a soft case and a bow. Before you consider buying something inexpensive and sight unseen on eBay, come try one of our instruments and see if it works for you. Often when you factor in the amount of work and adjustment that must go into a cheaper instrument to make it playable, it becomes less of a deal. Most people coming out of renting who are buying a nicer instrument for the first time tend to budget between $1000 and $2000 for a violin, and closer to $2500 for a viola. Remember to include anywhere from $300 to $600 for a case and bow when making your budget since instruments in this price range do not usually include either. We have several nice things always in stock that work well for people shopping in this range. Space does not allow us to keep many cellos on hand, but we usually have some student models available in the $2500 to $4000 range, not including the case or bow. For more advanced players we have instruments that range in price up to around $8000. Occasionally we have instruments available in a higher price range, but most people shopping in that range require a larger selection than we can provide at this time. We recommend people looking for instruments priced higher than $10,000 either contact Scott Sleider locally, or look in Chicago. Our suppliers include Eastman Strings, Amber Strings, Arcos Brasil, Amati's Fine Instruments, Everjoy Music, Fire Phoenix Strings, and others. We are particular about selecting instruments and bows directly from representatives as they come through town so we can try them carefully first. 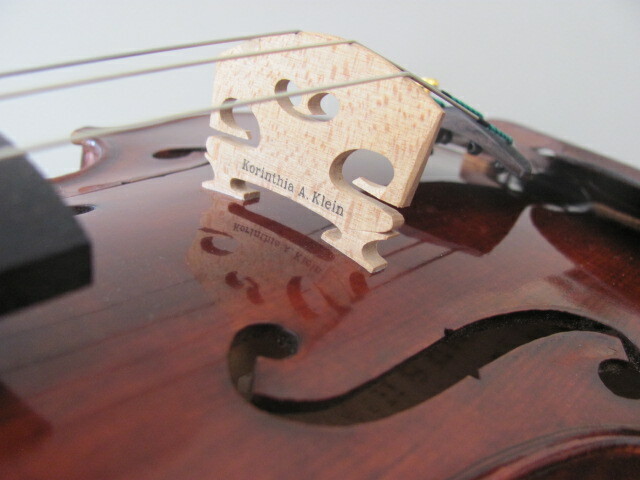 Korinthian Violins tries to support new and upcoming makers. We carry instruments by Korinthia, Robyn Sullivan, and othr makers in the Chicgo and Detroit areas. Buying work early in a makers's career is a good way to find quality handmade instruments at affordable prices. Most of our inventory is new instruments because we primarily serve students who are interested in lower purchase and maintenance costs, but we usually have some older instruments on consignment available as well. We are also happy to obtain handmade instruments for trial by local makers (such as Brian T. Derber) upon request. 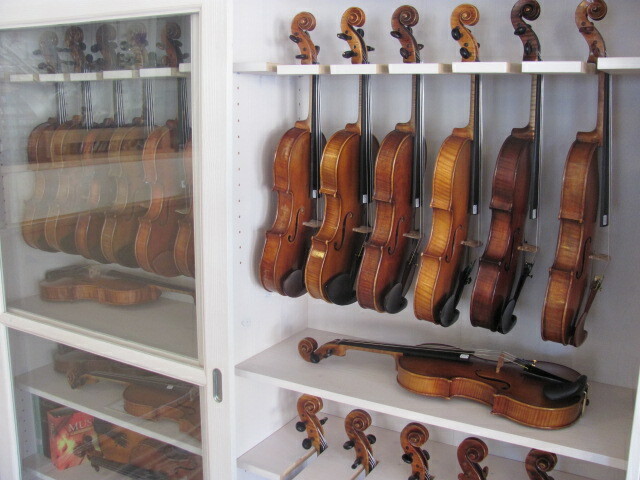 Korinthian Violins only rarely buys instruments from private sellers and almost never at a student level (unless the instrument was originally purchased from us). However, we are always happy to look at violins and offer an opinion on how to make an instrument more salable, although we cannot suggest a price. For appraisals we recommend people in the Milwaukee area contact Scott Sleider at 414-259-1095. We also recommend that if you have a workable student instrument that is going unplayed that instead of looking to sell it you consider donating it. We can put you in contact with several worthy programs that can use instruments and offer documentation for a tax deduction. Korinthia Klein also does work on commission, with violins starting as low as $6000 for a custom built instrument. We have rental level bows in all violin sizes available for $50. For students buying their first better bow we have pernambuco sticks available starting at just over $100, as well as carbon fiber bows from Coda such as the Prodigy and the Diamond NX. Better bows start at closer to $450, and we also carry the Coda Diamond GX which is an excellent professional grade bow. Currently we have bows that range in price up to $3500. Our our most popular violin case is the Courier which is only $150 and has excellent storage capacity. We usually have in stock an assortment of cases ranging from simple dart cases for $30 to $90, to an interesting variety of oblong cases between $150 to $300. Our favorite hard cello case is $525 and comes with wheels, several handles, backpack straps, and is usually available in several colors. We can also obtain special order cases from Bobelok, Tonareli, Concord, and Bam, and anything Shar offers we can usually have within a week.